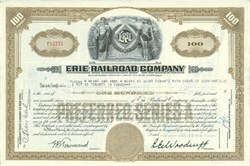 Pack of 100 Certificates - Erie Railroad Company - Price includes shipping costs to U.S.
Home > Certificate Quantities for Educators / Business Promotions > Pack of 100 Certificates - Erie Railroad Company - Price includes shipping costs to U.S. Beautifully engraved certificate from the Erie Railroad Company This historic document was printed by the American Banknote Company and has an ornate border around it with a vignette of an allegorical woman and an allegoric man standing beside a wreath that has the word "Erie" in the middle of it. This item has the printed signatures of the Company�s President and Secretary.